Commentators across the political spectrum are pointing to the German system of local banks as a model for Britain to emulate. In this report, Christopher Simpson explains how these local German Savings Banks (Sparkassen) operate. He describes the history, structure and organisation of the Sparkassen, which are only allowed to lend within a geographically defined area and, as a result, develop close relationships with their customers. 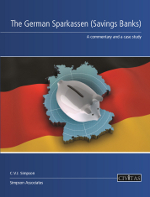 The Association of German Sparkassen granted Simpson unique access to their records for this report, allowing him to describe an actual example of how a German Savings Bank assesses an application for finance. This concrete example provides a strong insight into the causes of German economic success.